This is a typical ancient roadside shrine. If you look at the very top you'll see a little piece of flaked stone and on the piece of pottery to the extreme right you can just barely make out the fingerprints of the person who made it. In a time before our modern roads there were ancient roads that crisscrossed the desert, sometimes for hundreds of miles, others just to go from one valley to the next. On these ancient roads people walked for thousands of years long before there were even horses and wagons in the desert. Some of these routes gradually changed into our modern freeway system, however most of these ancient roads are unused and forgotten. One of the more famous is "El Camino Del Diablo" that is “The Road Of The Devil”. It has not changed much over the years, it is a dry dangerous dirt road along the US Mexican border, where if the desert doesn't kill you the bandits might. Another one parallels the Colorado River and goes past the Dead mountains on its way to Spirit mountain. No doubt these names are rooted in the ancient past. Yet one can still wonder what might have been lost in translation. On these ancient road trips it was important for an individual to have a good understanding of the weather, know how much they could carry, and what the locals currently thought of them. While on the road they were fearful of ghosts and evil spirits that might follow them. To appease these spirits they would leave small tokens along the way. Sometimes it might just be a little piece stone like Jasper other times a small broken piece of pottery would do. It would seem that these evil spirits of the road were relatively easy to appease. However today these roads are traveled mostly by ghosts from the past and the few mortals that do walk them leave no tokens to the spirits except for their trash and strange footprints. 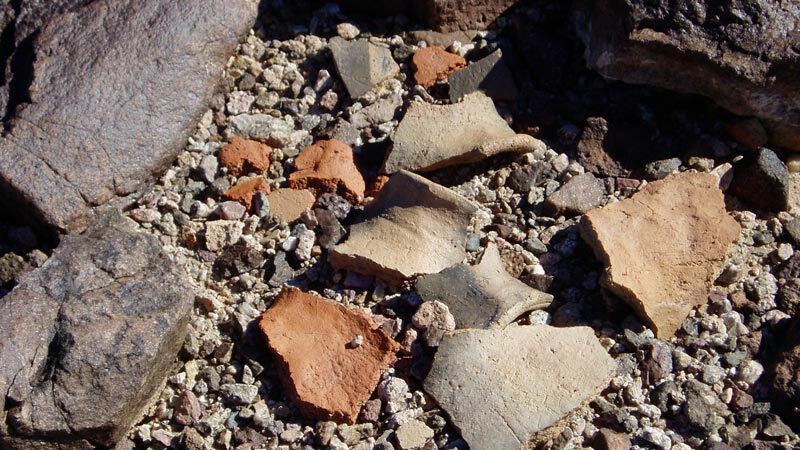 While one would be tempted to think that these small pieces of pottery and stone are nothing more than ancient trash their pattern and distribution says something quite different. Many of these little pieces of rock and pottery are found very close together and the pieces of pottery are not from the same pot. Another interesting fact is they are often found in places of significance like a fork in the road. We find a similar behavior in the modern world where people throw coins of little value into fountains. This of course is our way of recognizing the spiritual connection of water, that runs deep in human nature. So if you find one of these little ancient roadside shrines you can respect the ancient people that put it there, and your own spirit by enjoying it for what it is and leaving it alone. Leave it to the people and to the spirits that have yet to walk this ancient road. Then this will be the way of things, because you will it to be so.